Costume: Sun Girl has access to her father Lightmaster’s technology granting her superhuman abilities. Her costume grants her resistance to injury, the harness grants her the ability to fly. She also carries two blasters capable of firing concussive light blasts, they can also release a flash to blind enemies. Selah Burke was born to an unnamed black mother and white father by the name of Dr. Edward Lansky. Her father would became the supervillain Lightmaster. She is currently a college student who after finding her father’s technology moonlights as the superhero Sun Girl. 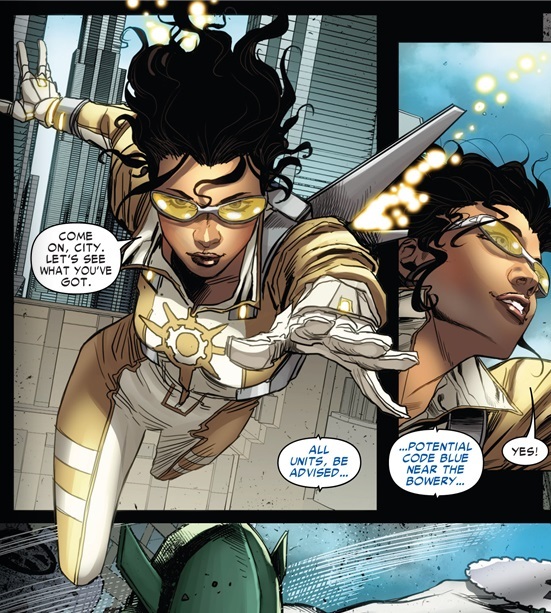 Selah had been observed by Superior Spider-man [Superior Spider-Man Team Up #1, 2013]. When she attempted to stop Whirlwind she was pulled into a gang war between the Superior Six Spider-man’s enforcers and the Masters of Evil. During the exchange she ran into her father as Lightmaster and revealed her identity as his daughter while helping Spider-man end the threat [Superior Spider-Man Team Up #6, 2013]. After saving the day she parted with Superior Spider-man on bad terms [Superior Spider-Man Team Up #7, 2013]. The art design is ABSOLUTELY WONDERFUL !! Very interesting team , especially Sun Girl !